The sides meet in Division 1 of the Allianz football league. Roscommon take on Cork on Sunday in Páirc Uí Rinn. ROSCOMMON HAVE MADE two changes for Sunday’s trip to face Cork in Division 1 of the Allianz football league. Sean Purcell comes into the half-back line for Ronan Stack while in attack Senan Kilbride starts at full-forward with Conor Daly the player to lose out. They’re the only changes by managers Kevin McStay and Fergal O’Donnell as the Rossies seek to build on their victory over Kerry last time out. Throw-in on Sunday in Páirc Uí Rinn is 2pm. Email “Two changes to Roscommon team for Sunday's clash with Cork”. 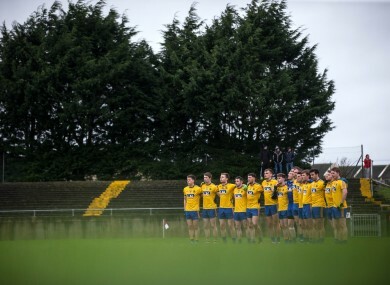 Feedback on “Two changes to Roscommon team for Sunday's clash with Cork”.